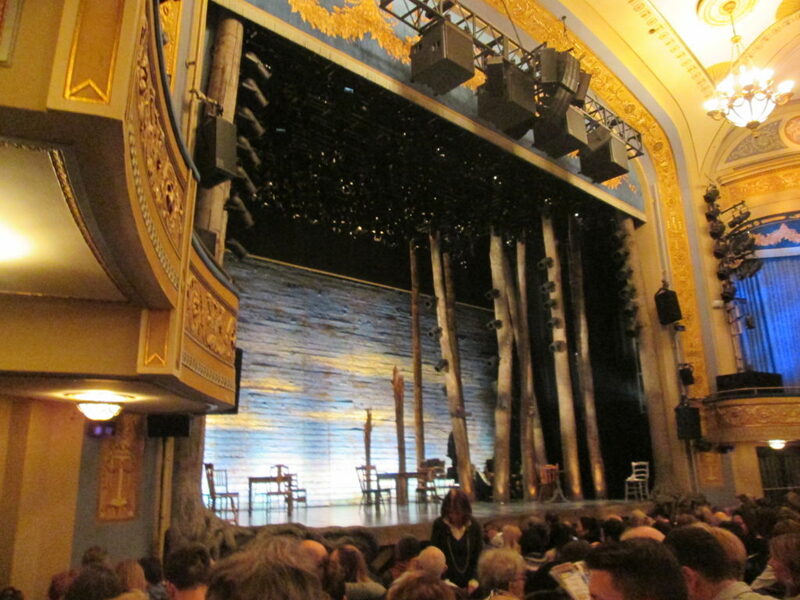 Review: Is Come From Away Appropriate for Kids? Is Come From Away appropriate for kids? When my parents come in town, they ask me to find a Broadway show appropriate for the whole family. That includes two teens and my parents, who are in the senior age range. Just with my parents alone it’s hard to find a show they’ll both like. Disney shows aren’t going to cut it. Last year we saw Oh, Hello! That was great for everyone except my youngest child, who was an early teen and didn’t get a lot of the jokes. This year I picked a winner with Come From Away. If you follow politics, this is the show that the lucky Ivanka Trump attended with Justin Trudeau. How all of us would liked to have been in the seat next to him (except that I cried throughout the show, so maybe that would be a bad idea). Is Come From Away appropriate for kids? Read on. 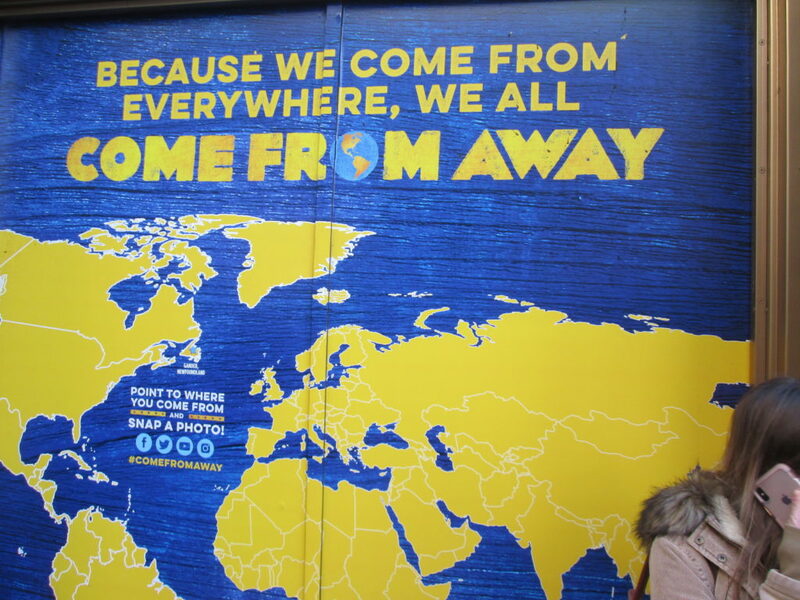 Come From Away is about the six days that about 6,700 people from around the world spent in the small town of Gander, Newfoundland starting on September 11, 2001. After the planes hit the World Trade Center buildings, incoming U.S. air traffic was diverted. About 38 of those planes went Gander, which has a big airport. Turns out this airport was built as a refueling spot when planes couldn’t travel as far on their existing fuel. The town was built from that, and the population of 10,000 wasn’t much larger than the number of guests they took in. First, can you imagine that you’re a town of 10,000 and you have an immediate influx of 6,700 foreigners from 100 countries, some of whom don’t speak English? They’re all still on the planes and the planes are being treated as bomb threats. What do you do with the people? What do you do with the planes? People stayed on those parked planes for 21 hours. There are some funny parts in the show about what people do for 21 hours when stuck on a plane (in addition to go through the plane’s liquor supply). And it’s 21 hours in which most passengers don’t know what’s going on. They mostly can’t get through to friends/family on their cell phones, if they even had them with them (2001, remember?). The pilots weren’t sharing any information. How do you coordinate that many people, finding them housing, transportation and food? They had to think of everything, from diapers to feminine products, from prescription medications to kosher food and phones. That’s what the show is about. How do you care for all these people who are stranded with no luggage (it remained on the planes) for up to six days? Well, your turn your hockey rink into a freezer, for one. An ensemble cast of 12 play several parts each, including those from Gander and the “plane people” as the travelers were called. The stories are taken from interviews the writers did with those who were there. Read more about the real people featured in Come From Away. The simple set turns chairs into an airplane, chairs into a community building where some slept and ate. Costume changes were as easy as putting on a jacket or hat. That with an accent turned someone into a new character. In the show you’ll meet Captain Beverly Bass, the first woman to become an American Airlines captain (at age 34) (by the way, she’s seen the show 67 times, from its debut in California, to Broadway). You’ll meet a gay couple from Los Angeles who are afraid to let others know they’re gay, in case Gander residents have an issue with that. You’ll meet a NYC firefighter’s mother, whose son is missing during her time in Gander. You’ll meet a black man who is asked by locals to just grab grills from residents’ yards for a community BBQ. Not only does he take their grills (under much duress), but he’s invited in for tea by each household when he takes them. You’ll meet a Texas woman and a British man who met on the plane and flirt their way through their Gander time, only to marry years later (spoiler – sorry). And of course you’ll meet people from Gander too, like the bus driver whose union is on strike and fighting for a new contract. And the town mayor who takes in visitors to his home. And the pet shelter volunteer Bonnie who makes sure the animals on the plane are fed and cared for. And Beulah, the caretaker extraordinaire. And there’s the news reporter who is not only new to town, but green as well. She made her international debut as the only on-air newscaster in Gander. Should you see Come From Away? While Come From Away rarely pulls at your heartstrings in a cloying way, I found myself tearful throughout much of the show. It wasn’t the words or the songs, so much as the reliving the experience. And partly it’s because one of my close friends was on one of those planes stranded in Canada, possibly Gander, after she had experienced some serious medical problems. She died earlier this year of the cancer she had during that time, and the show made me think of her. In spite of the stress of the situation and the characters, Come From Away is an uplifting show, highlighting (mostly) the best of humanity. It’s not all Pollyanna happiness. But it does give you faith that there are good people in the world, and when it comes down to the basics, people will help other people. Come From Away doesn’t use foul language. It doesn’t have anything sexually provocative in it (there’s one solid kiss). But it does have adult themes. Does your child know what happened on September 11, 2001? Is your child prepared to see a mother in despair not knowing if her son, the firefighter, is alive? Or hearing about a pilot who Captain Beverly had drinks with two days before, being the pilot of one of the planes flown into the World Trade Center? There’s some heavy stuff, and for this reason, it’s not appropriate for all kids. Of course since 2001, the Gander story continued. The residents of Gander and the surrounding towns wouldn’t accept any money from the “plane people.” Aside from showered the community with gifts via mail when they returned, one passenger on a departing plane started an academic scholarship fund to help with college costs for the area youth. That fund reached $1.5 million this year and more than 225 kids have benefitted. Gander has hosted reunions and some of the “plane people” have returned many times and maintained cross-border friendships. Tickets: Come From Away. 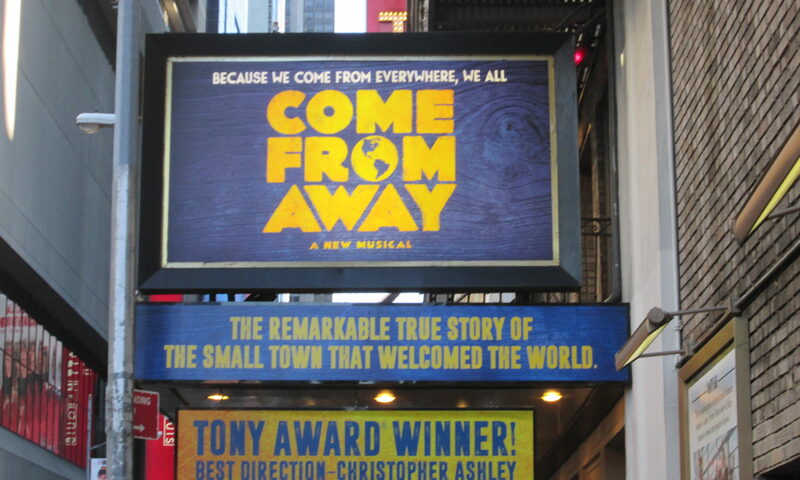 For info on discount tickets for Come From Away, see our Broadway for kids page at the bottom. Show length: Come From Away is about 100 minutes, with no intermission. I just cam from this show and it has the F bomb about 4 times and sh*t and a*ss, God and Jesus in a profane way so I’m not sure how the person can say it doesn’t have foul language.